This medal is awarded by the New Zealand Plant Protection Society to honour those who have made exceptional contributions to plant protection in New Zealand in the widest sense. The medal is awarded for outstanding services to plant protection, whether through research, education, implementation or leadership. In 2017, the New Zealand Plant Protection Medal was awarded Prof David Maxwell (Max) Suckling. In his 35+ years of research, Max has been pivotal in bringing odour-based technologies to New Zealand. In particular, his research on insect pheromones has enabled integrated pest management to be realised in this country. 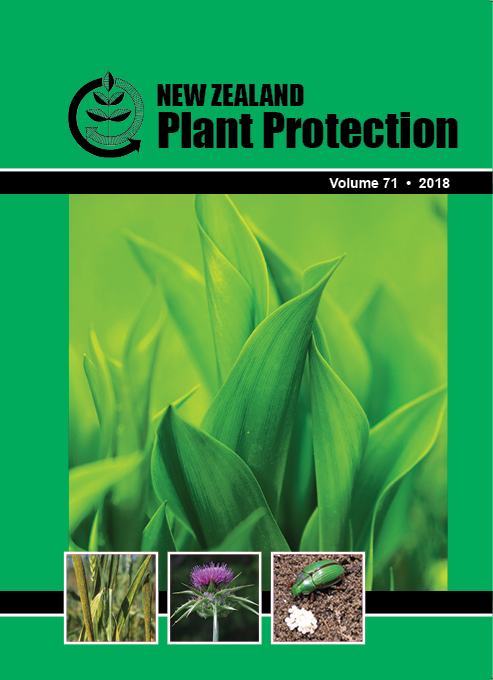 As a result, New Zealand plant-based industries can access premium overseas markets due to the low pest prevalence and low pesticide residue on primary produce. It has also reduced grower exposure to pesticides. The acknowledgement of his broad knowledge of risks and benefits that new organisms and substances can pose to New Zealand has been exemplified by his position of Chair of the Environmental Risk Management Authority Hazardous Substances and New Organisms Committee where he presided over decisions from determining which organisms are new to New Zealand through to whether the benefits of the release of new organisms outweighed the risks. His unique knowledge and ability to make sound judgements based on the evidence presented also led to two invitations back to the Environmental Protection Authority after he had finished as a special member on the Committee so that New Zealand could safely continue to assess the use of biological control agents. Since 2004, in his role as Science Group Leader of the Biosecurity group at The New Zealand Institute for Plant and Food Research Ltd (PFR), Max has been instrumental in developing tools to improve detection sensitivity and socially acceptable eradication options for new pests that threaten New Zealand, such as the Queensland fruit fly and the painted apple moth. Max has been a member of the New Zealand Plant Protection Society for many years and served as President from 1999 to 2001. He was nominated for the Medal because of the passion he has displayed towards developing and making available socially acceptable pest eradication and management tools in New Zealand. The work that he and the chemical ecology team he has built and led, has had a large impact in many sectors from horticulture to biosecurity. This use of socially acceptable tools for the productive sectors naturally led to Max’s involvement in the pest surveillance and eradication space. He led the Eradication and Response Theme in the Better Border Biosecurity collaboration for over ten years, co-ordinating research among Crown Research Institutes to achieve their goals and the goals of New Zealand’s biosecurity practitioners. He has gone beyond odour-based technologies and branched into sound, vision and sterile-insect technologies for managing pests, sticking with the social acceptance theme. Max is an innovative thinker, testing novel approaches for pest management, and can bring quite separate groups together to achieve a goal. For example, he combined an irradiator used to sterilise medical equipment and insect rearing to achieve a boutique insect-sterilisation programme against the painted apple moth. By pushing the envelope, he is seen as a world leader in his field of using socially acceptable tools, with numerous invitations as a keynote speaker at international meetings, which has allowed him to return to New Zealand with some of the latest scientific ideas. He has served on working groups of the sterile-insect technique for the joint division of the Food and Agriculture Organization/International Atomic Energy Agency. He was recently made a professor when he was made a joint appointment at PFR and the University of Auckland, and has supervised and co-supervised a number of PhD and MSc students. His outstanding collaboration and mentoring skills enable him to work across diï¬€erent fields, secure new knowledge and tools for novel pest-management approaches, bring together people from diï¬€erent organisations, and mentor ‘thinking-out-of-the-square’ scientists for the future. His desire to protect New Zealand’s flora, fauna and people, make him a worthy recipient of the New Zealand Plant Protection Medal.